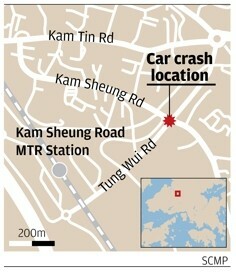 A baby girl was among four people killed in a crash between a minibus and a truck in Kam Tin in the afternoon today. Police said that the baby died along with two men and a woman at the scene. Fourteen others were injured, many seriously. Some of the minibus passengers were trapped in the wreakage. The minibus was seriously damaged and left lying on its side after the crash. Debris from the two vehicles and the belongings of the victims were scattered all over the road. Remains of the deceased were covered up with black plastic bags, while the injured waited for paramedics on the road, before they were rushed to Tuen Mun, Pok Oi, and Northern hospitals for treatment. The 60 year-old truck driver has been arrested for dangerous driving causing death, but police say there's no indication that alcohol or drug use was involved. Four people, including a three-month-old baby girl, died instantly when a full minibus they were travelling smashed into a truck and flipped over in Pat Heung yesterday afternoon. Another 14 were injured, most suffering head and neck injuries, broken ribs and concussion, and at least four women were in critical condition last night. Seven were in serious condition, while the other three were stable, according to the hospitals. The truck driver was arrested last night on suspicion of causing death by dangerous driving, police confirmed. An alcohol test cleared him of drunk driving. 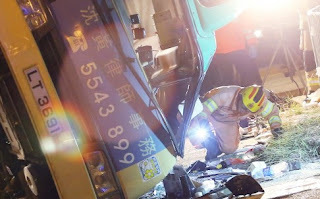 More than 20 ambulances and fire engines were deployed after the horrific crash at the junction of Tung Wui Road and Kam Sheung Road at about 4.45pm. The green-topped minibus flipped onto its side and skidded across the junction, while the truck was damaged at the front. According to the Fire Services Department, many people were trapped in the minibus. It took firefighters 30 minutes to break into the minibus and free them. A video-clip posted online showed a number of trapped passengers with their arms out of windows waving for help. 53-year-old woman, Chan Kwai-chun, and 58-year-old man, Tang Tung-hei. Ten of the injured were being treated in Tuen Mun Hospital while four were taken to North District Hospital. Among the four women in critical condition in Tuen Mun were the baby’s grandmother and aunt. Acting health minister, Professor Sophia Chan Siu-chee, said specialists were trying their best to provide treatment, while off-duty staff had been asked to report to work in emergency wards. Secretary for Labour and Welfare Matthew Cheung Kin-chung said social workers from his department would offer assistance to the injured and their families, including emotional and welfare support. He said several of the victims were from Wang Toi Shan village and he was liaising with the village chief on how to help the families. Lawmaker Michael Tien Puk-sun, chairman of the Legislative Council’s transport panel, reminded all minibus passengers to always wear seat belts – a rule that is largely ignored. He added that minibuses should install sensors to tell drivers if passengers were not strapped in. Traffic in the area was severely disrupted for several hours after the accident.